All Slides feature replaceable slide blankets, and replaceable high-density foam climbing steps. Additional tie-down straps, safey netting, and curved stop walls are just a few of the exclusive features that help make our inflatable slides some of the safest in the industry! The 24' Single Lane Slide is truly massive. This is a great unit for your rental business, Church, or institution. Made of heavy duty commercial grade 18oz reinforced PVC Tarpaulin material. Our KidWise Units are backed with a One Year Warranty against material defects and workmanship. All Slides feature replaceable slide blankets, and replaceable high-density foam climbing steps. 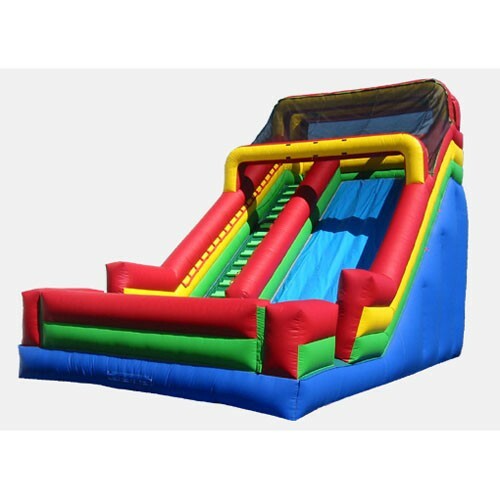 Additional tie-down straps, safey netting, and curved stop walls are just a few of the exclusive features that help make our inflatable slides some of the safest in the industry!